The crocodile who caused a plane crash made headlines all over the world but there’s no real evidence that the croc was ever on the plane, let alone caused the passengers to stampede in fear. The idea of the in-flight stampede to run from an unexpectedly toothy aircraft occupant was related by the one surviving passenger. But she initially told investigators that that the passengers panicked because the aircraft was landing at a reserve strip instead of runway 11/29. Two months later, she changed the story and told a Congolese tabloid that the panic was caused by a crocodile on board. She had no explanation as to why they would all run to the cockpit for safety. 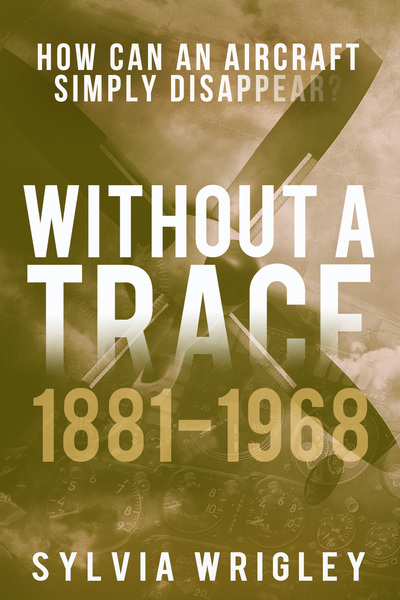 A British air accident investigator at the pilot’s inquest dismissed the stampede theory and stated that the most likely cause of the crash was that the aircraft stalled on final approach. OK, this isn’t actually an encounter with an aircraft but the camera was flying, so I think that it just about counts. Farmer Mia Munsell discovered a mud-spattered GoPro camera in her pig pen and of course immediately went to see if there was anything recorded on it. To her surprise, she discovered that the camera had fallen from a skydiving aircraft and filmed everything all the way down, including one of her pigs trying to discover if it was edible. The camera had been in the pig pen for eight months and in what’s been called “the best advertisement for GoPro ever” survived with the footage intact. She uploaded it to YouTube where it swiftly went viral. This British Airways Boeing 747-400 was coming into land at Heathrow when a dead fox was discovered on runway 27L. This is apparently not a rare situation in the southeast of England. Eight or nine aircraft had to go around while catering airport staff cleared the runway of the carcass. A midair collision between a jetliner and a fish — that’s right, a fish — delayed an Alaska Airlines flight for about an hour while the plane was inspected for damage. “They found a greasy spot with some scales, but no damage,” said Paul Bowers, Juneau airport manager. And how can a jet hit a fish? It’s easy, if the fish is dropped by a bald eagle. The incident occurred as the Boeing 737 took off Monday morning from the Juneau airport, the plane’s pilot told Bowers. About 400 feet past the runway’s end, the jet crossed the flight path of a bald eagle, fish in talons. “The law of the jungle prevailed,” Bowers said. “As the larger bird approached, the smaller bird dropped its prey.” The fish hit a small “eyebrow window” at the top of the cockpit, Bowers said. A mechanic was dispatched to the plane’s next stop in Yakutat, 200 miles to the northwest, said Jerry Kvasnikoff, Alaska Airlines customer services manager in Juneau. The eagle apparently escaped injury. The fish, species unknown, is presumed dead. “This time of year, if I had to guess, it might have been a cod,” Kvasnikoff said. “You never know what an eagle will get into. 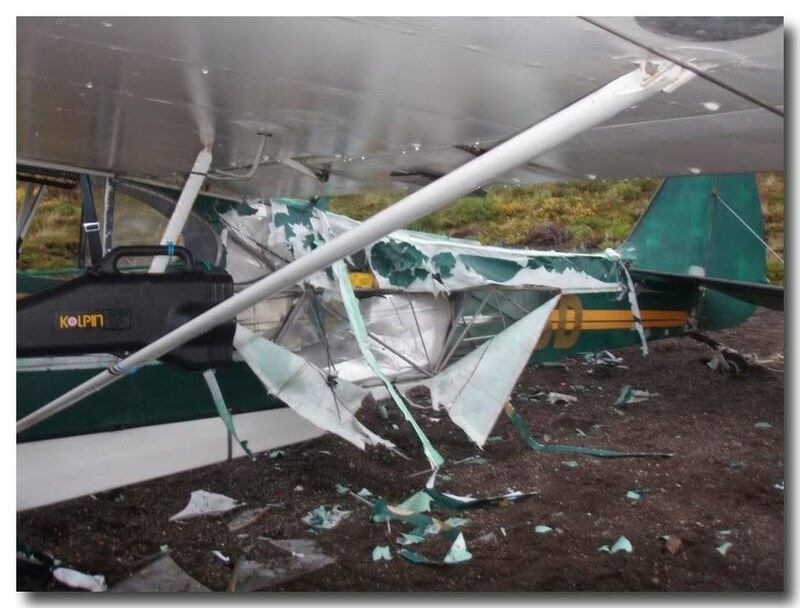 Kvasnikoff and Bowers said this was the first airplane-fish collision they had heard of, but they said jets occasionally collide with other forms of Alaska wildlife. “Over the years, we’ve had planes hit various critters — moose, deer, every kind of bird. But that’s a first for fish,” Kvasnikoff said. The moose collision, by the way, occurred on the ground. It happened more than 10 years ago on the runway of the Cordova airport, and the moose inflicted considerably more damage than the fish. 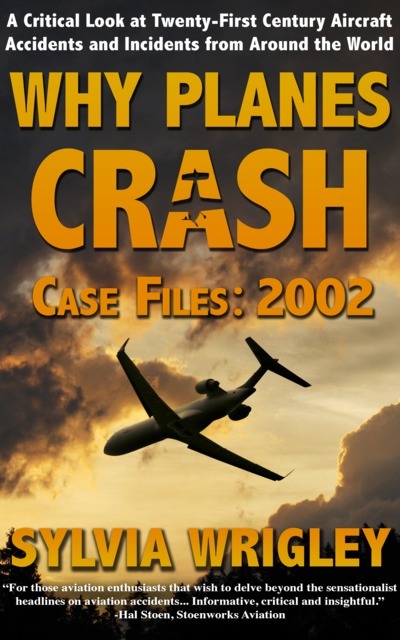 “It cleaned the nose wheel of the plane — collapsed the front gear,” Kvasnikoff said. The pilot and his passengers never even saw the cow, they said, and were surprised to see it on the footage when they reviewed the landing. Shortly after takeoff, when at approximately 200 ft above ground level, the engine speed dropped to idle. 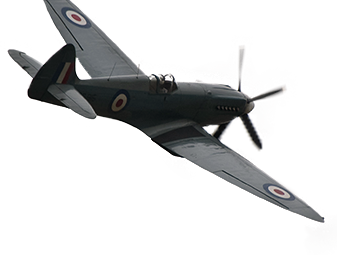 The pilot lowered the nose of the aircraft to maintain flying speed and turned right to land in a suitable field. The aircraft cleared a sturdy barbed wire fence but, as the aircraft touched down, a cow ran under and struck the left wing. The cow was apparently uninjured. Investigation of the aircraft by a local engineer found corrosion debris in the carburettor. Then there’s the jet that managed to hit two cows coming in to land at Djalaluddin Airport, Gorontalo. The Lion Air jet carrying 110 passengers and seven crew crashed into the cows who were wandering on the runway and became dazzled by the landing lights. The only injuries were two passengers who ignored the cabin crew request to remain seated but instead evacuated through the right over-wing emergency window on their own. Original news reports said that the condition of the cow was unknown, however AV-Herald describes the cow as embedded under the main gear, so I don’t think there’s a happy ending there. At 1313 UTC, the aircraft touched down at runway 27 and during landing roll the flight crew saw some animals ahead were crossing the runway. Then when approximate 550 meters from the beginning of runway 27 and at aircraft speed approximate at 120 knots, the aircraft hit such animals. 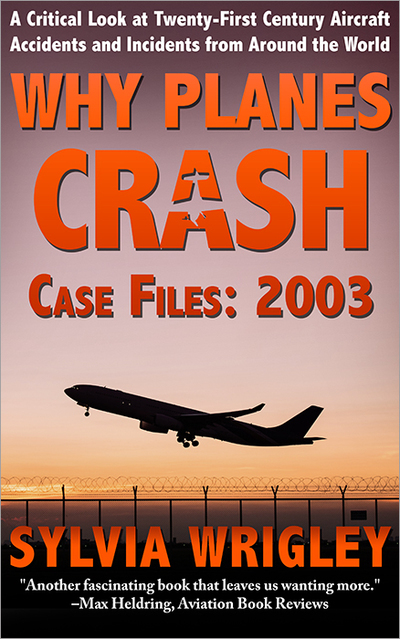 Afterward, the pilots felt ineffective of brake respond and then the aircraft veered off to the left and trapped on the left side of the runway shoulder at about 2,100 meters from the beginning of runway 27. The smell of burning meat entered the cabin during the landing roll and went out after the engines shut-down. Wouldn’t it have been awkward to have a bird strike with a flightless bird? The video went viral and I managed to contact the pilot, who was happy to tell me all about it. I touched down 80 metres from the threshold and was just letting it roll out (save the brakes and undercarriage on the rough strip) and the speed had just dipped below about 90kts. Approach on the PA-601 is about 100. As you can hear, we were discussing the state of strip, which used to be very wide, but the grass is narrowing it further each year. 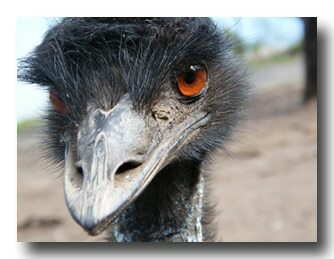 An emu was sitting on the side unseen in the bushes and we obviously startled it, and it bolted from cover in front. One of my passengers yelled out, and I jumped on the brakes, hard, and washed off about 40 knots in about 3 seconds! The emu went in front of us and lost his footing on the loose dust, just as the wing passed harmlessly over him! The Emu probably has his own opinion on top five aircraft he never again wants to see in his territory. 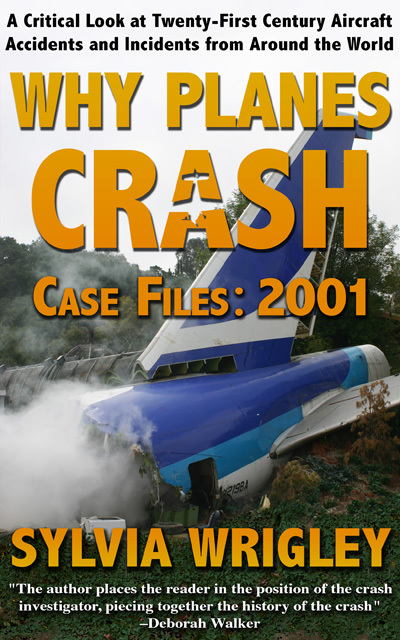 In 2009, I published a series of photographs of an aircraft mauled by a bear. That blog post is still my most popular of all time. 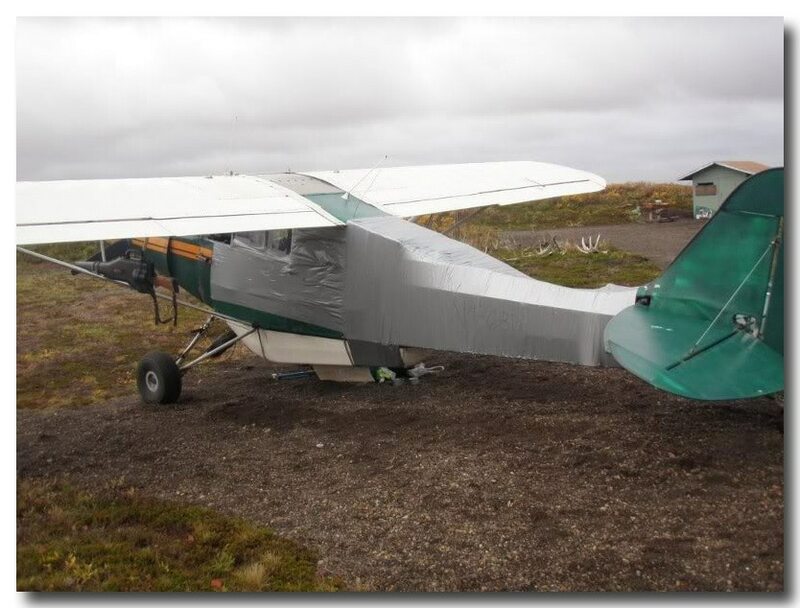 The photographs showed a Alaskan Piper Supercub which had been mauled by a bear and the amazing aircraft repairs done by the pilot. You can see all the photographs on my original post: Fear of Landing – FAA Approved? Alaska Dispatch got the full story from the pilot’s father a few months later. The bear, it seems, had been locked out of a meatshed where it had previously found succulent moose steaks free for the taking. When it found it couldn’t get in, hunter LaRose thinks that it turned its fury onto the aircraft. After a few days of meticulous fix-it work, the plane was airworthy enough to fly back to Anchorage. Miller fitted the windows with plywood and Plexiglas, replaced the tires and the horizontal stabilizer (the bear either leaned on it or sat on it), and, according to Miller’s dad, fashioned a makeshift fabric skin out of 25 rolls of duct tape and some industrial-strength plastic wrap. As for the bear, it hasn’t been seen since. It may have been “whacked” during bear hunting season in October, or it may be playing it smart. After all, bears know when it’s time “to get the hell out of Dodge,” according to LaRose. Nice collection ! It goes to show that animals and aircraft usually do not go well together. My only experience like these was when landing at Cotonou in the ‘seventies I nearly hit a very large python crawling across the runway. I flew a light aircraft, possibly a Cherokee and had more than enough runway ahead to pull up and over it. But the poor python did not learn it’s lesson. A passenger aircraft (I forgot what type) a short while after reported hitting a snake when landing. I watched a fire crew very, very, very carefully approaching the dead reptile and removing it. I did not see it, it probably ended in the cooking pot. The aircraft was not damaged. And honorable mention for the cat.